You see, I’m doing aging all “wrong.” I was told that I came out of the womb cynical, I was a bitter human being in my teenage years, and I was absolutely miserable to be around in my early 20s. But the older I get, the more idealistic I get. I still have my snarky moments, but I’m younger than I ever was before. And I like to think I snark in good fun. From “Petit Livre d’Amour” by Pierre Sala c. 1500. The thing about Valentine’s Day is that whatever people think it is now, it predates industrialization and, yes, even Hallmark. Chaucer is who we tend to blame (although there are multiple legends involving various Saint Valentines), and by the Middle Ages, it was a day in which lovers would give one another flowers and sweets and valentines. Now, I’m not much of a romantic, unless you want to peel away my rather prickly layers, but I, queen of solitude, have become increasingly fond of the idea of love. Romantic love holds little interest to me, but there are all other sorts of love – friendship, familial love, love of country, love of literature, love of music, hell, even Aristotle’s final cause that produces motion as being loved (1072b4). And I’m glad I live in a part of the world where those kinds of love can flourish (well, maybe not so much Aristotle’s), where human beings connect with each other freely over their interests and ideas. Because I can imagine a type of world where that isn’t possible. I can imagine bleak landscapes and empty minds and factories where human beings are bred and brainwashed in a far more stringent way than we are now, shaped by the culture around us. And it makes me grateful for the world I do live in. For my family. And my friends. And for music. And for words. And for love in all its forms. I’m kind of guessing at the Bekker number, but I know it’s in Metaphysics Λ. 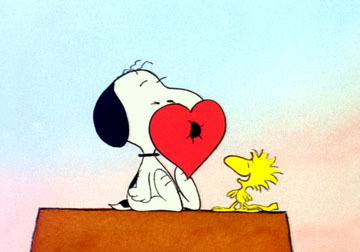 This entry was posted in Uncategorized and tagged Aristotle, Charles Schulz, love, Valentine's Day. Bookmark the permalink.